Monograph Lycoperd: p. 23. 1842. Fruiting body subglobose, 10-20 mm broad before splitting, outer mycelial layer initially binding debris, soon lost, thus appearing debris free; expanded fruiting body 1.5-3.5 (4.0) cm broad; exoperidium splitting to form 5-10 rays, upper surface of rays various shades of brown, more or less glabrous, strongly hygroscopic, i.e. curled over the spore sac in dry weather, lying flat to slightly revolute when moist; endoperidial body or spore sac sessile, 6-15 mm, the surface grey-brown in youth, furfuraceous, fading to nearly white in senescent specimens; peristome indistinct i.e. usually the same color as the spore sac, the opening slightly elevated with a fibrillose margin. Spores globose, warted, 5.5-7.0 µm including ornamentation, with a single guttule. Solitary to scattered in dry, open areas and sandy soils; distribution poorly known; collected in coastal areas, but may occur in montane regions; fruiting after fall rains, present throughout the year in dried state; uncommon, easily overlooked. 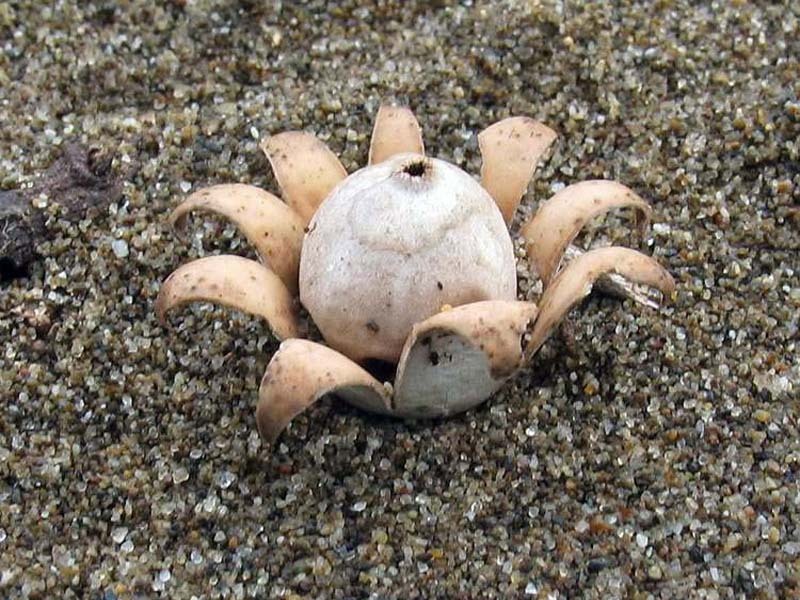 An important fieldmark of Geastrum floriforme is its hygroscopic habit, i.e. the ability of the rays to expand and close around the spore sac with changing humidity. This contrasts with most Geastrums, which at maturity do not respond to changes in humidity and are "fixed." 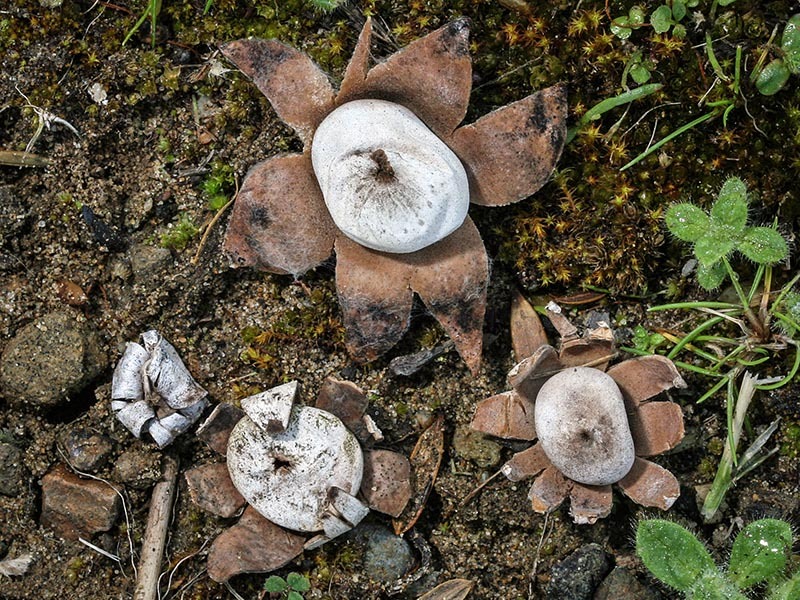 Geastrum floriforme may be more common than records indicate. 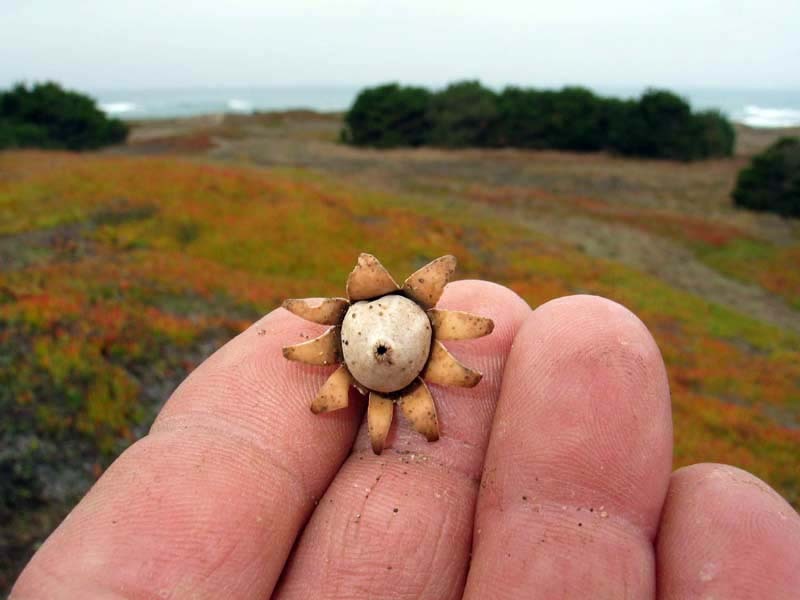 Although rarely collected it is probably overlooked because of its diminutive size and appearance which when dry resembles a small seed pod. 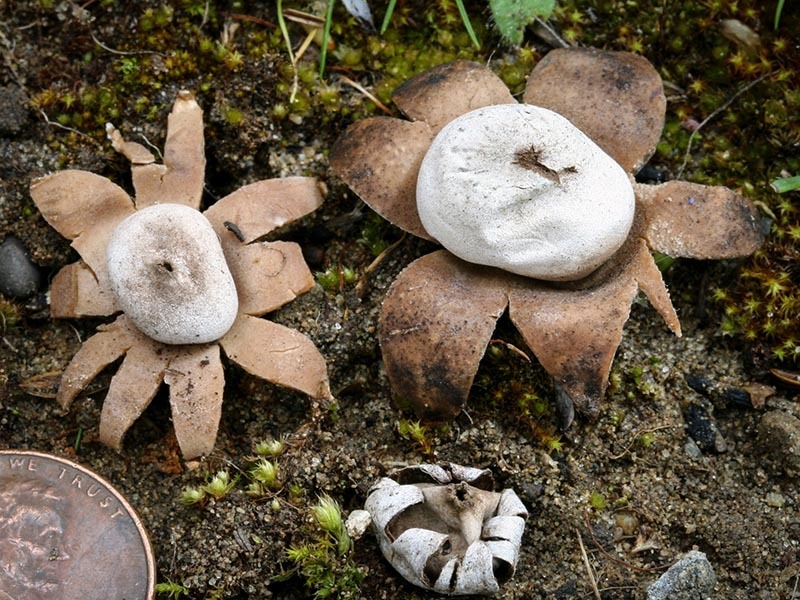 Other hygroscopic Geastrums that may occur in California include Geastrum corollinum which differs in possessing a well defined peristome and smaller spores; Geastrum arenarium which is only partially hygroscopic with a spore sac that sits on a short pedicel, and Geastrum kotlabae, which has a plicate peristome. Calonge, Francisco D. (1998). Flora Mycologica Iberica. Vol. 3. Gasteromycetes, I. Lycoperdales, Nidulariales, Phallales, Sclerodermatales, Tulostomatales. J. Cramer: Berlin, Germany. 271 p.
Pegler, D. N., Læssøe, T. & Spooner, B. M. (1995). British Puffballs, Earthstars, and Stinkhorns. Royal Botanic Gardens: Kew, England. 255 p.
Sunhede, Stellan (1989). Geastraceae (Basidiomycota) -- Morphology, Ecology, and Systematics with Special Emphasis on Northern European Species. Fungiflora: Oslo, Norway. 535 p.